Just as a note, I did receive an advanced copy of this book from the publisher with the idea that I would put up a review on my blog and whatnot. However, my enjoyment of this title had absolutely nothing to do with this fact.An Eagle's Heart by Scott ButcherWhen I first came across this book, back when it was titled after one of the more central characters in the story, THE MERLIN FALCON, I was instantly enamoured with Scott Butcher's ability to characterize the avian community in such a regal, yet real-feeling manner. I found myself wanting to read through the entirety in one sitting, then, however, due to some form of distraction, as is often the case, I didn't.That was one of the early drafts of this tale of honor, however, and I was lucky enough to be approached by Butcher's publisher to get to review the final version, which was released just this week!First thing to note, this book is a quick read. My kindle told me it would take me about 2 hours to read the whole thing. It was pretty darn accurate. Second, this is a book written with children as its intended audience, meaning there's very few difficult words or phrases to slow you down. Thirdly, Butcher puts together a novel that manages to capture your attention from the word GO and makes it very difficult to put down, which is quite obvious from the fact that it took me a little over a day to get through the 110 pages of bird-filled awesomeness.I'm being completely honest when I say I can't recommend this title enough. Butcher's voice is amazing as he jumps from falcons, eagles, chickadees, and an old man (who may perhaps just happen to be the voice of the author for this story). Each species feels as though there is a rich history of tradition that they have followed since time immemorial. And this tradition seems to motivate each and every action throughout the book, creating a feeling of being involved in something much more epic than appears to the old man and his family, something that would change how the world itself works.Simply put, Butcher has put together a simple story of redemption and being true to one's self, all wrapped up in a very imaginative tale of honor that strikes right to the heart of every reader...I suppose you could call it the "eagle's heart"....too on the nose? 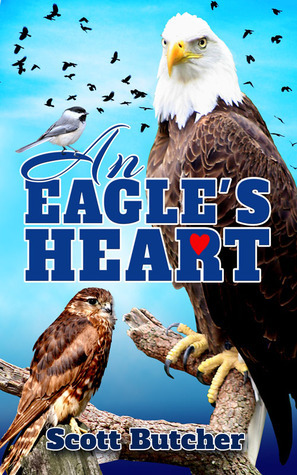 An Eagles Heart is a great book for middle grade readers, but it will also appeal to readers of all ages. The characters are birds for the most part, but Mr. Butcher crafts all of them with a fine tooth comb and the result is a cast of believable players from brave hearts to bullies.Some you will hate, and some you will love, and to me Butcher has hit on the most important result for any novel and that is to evoke emotion in the reader, and an Eagle's Heart certainly delivers that. Even the human characters towards the end are believable, and the author dares to step toward an often taboo subject of terminal illness.I would highly recommend this book for anyone wishing there was another book like Watership Down. Young readers will like the fast paced adventure, and will likely learn a few life lessons from this story. My only regret is that there are only 5 stars to rate this fine story. It is obvious that the author likes and respects birds (crows aside), and must have spent quite some time watching them, observing their little mannerisms, and considering how they'd talk, if they could. There's a lot of love and patience palpable in the way the bird characters are drawn. Their world is simple, yet complex. This is an enchanting tale of honor and respect, of loyalty and courage, and of how a single thoughtless, angry act can endanger many, whereas a single brave, selfless act can change the world for better. By the way, the entire message is given without ever sounding sermonizing, which tells me that the author also likes and respects his intended audience. This author definitely dislikes crows! Then again a group of crows is not called a murder for nothing!This is a lovely story of the heroism of birds joining forces to defeat cruel enemies. The writer neatly combines a great knowledge of birds and nature with high adventure and a moving human story. It has one of the most lovely endings I have read, a real heart-lifting moment.Highly recommended for older children. A terrific kid's book. In addition to the brave, against-all-odds, main birdy character in the inspirational Merlin Falcon, there's a huge undercurrent of powerful human emotion with the 'old man' character. It's a rock (or is that Rocky) solid story with appeal to kids (and adults) of all ages. Highly recommended. My class loved this story! It has a great message about bullying and teaches without them knowing it! A story of valor, strength, and loyalty gives hope of how one voice, however small, can change the world. Although targeted toward the Middle Grade audience, I highly recommend this book to all. On the one hand, “The Eagle’s Heart” is a sad tale about betrayal, revenge and redemption; and on the other, it’s a hopeful tale about guardianship, survival and teamwork. It’s perfect for grandparents who want to read a novelette to their grandchildren; so these themes can be discussed openly and lovingly. *** SPOILER ALERT ****The story starts, almost immediately, with a murder. A crow snatches an unhatched egg and as payback, a merlin kills the crow. Soon afterward, a cast of amorphized birds (i.e. blue jays, falcons, song birds, humming birds, eagles, chickadee, robin, hawk, south geese) are in a hunt, one of vengeance. In the proceeding chapters, a chickadee’s eye is gouged out; two rivals viciously fight for a piece of meat in midair; some target each other as prey; and another slays (yet again) near in the end. Wow, intense for a children’s story. However, the author balances out the grim with the pleasant. In between the story of pugnacious birds, another is weaved in about a household who is watching the “strange flock of birds.” It starts out with an old man welcoming his estranged and sickly daughter and curious granddaughter into his home and as they gradually heal old wounds, they witness the hunt with shock. But the author doesn’t stop the story there. In the final scene, a bald Eagle befriends a chickadee and a robin and the family is amazed by their bond, just as they are amazed by their own reconnection.The author has a gift in describing the entire scene – especially the bird’s territory – the heart of the stone forest, its groves, its tamarack pines and the skyline above. His writing is simple yet beautiful. Congrats, good job, I hope librarians will endorse this fantastic book. Well it's my book (I wrote it) so I might be a little bias. But every time I go and look at it again, I'm amazed by some detail I'd forgotten. There's the story of the one eyed chickadee and his friend the robin, who both find their eagle's heart. There's also the story of an old man, whose daughter returns home after a long estrangement. The daughter brings home a grand-daughter the old man has never met, but she also has bad news.This is a story for children upwards from 9, but I'm sure adults would enjoy it too.